Team a skip-the-line tour of the Accademia Gallery with a tour of the historical center of Florence. 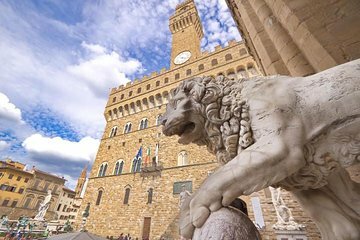 Perfect for first-time visitors to the Tuscan city, the experience starts with a walk to see key monuments such as Florence Duomo and Palazzo Vecchio. Hear their history and secrets from your guide, then step inside the Uffizi Gallery to discover its wealth of Italian artwork. Gaze at renowned works including Botticelli's Birth of Venus, and learn about the likes of Michelangelo, Raphael, Titian, and more. Excellent tour! My guide was Marcelo, and he was so nice and SO FUNNY! He gave a really fun, enjoyable, and informative tour and was highly conscious of his surroundings. Whenever there was a noisy group near us, Marcelo would move us away from them so we could hear him better, and I appreciated that so much. One thing I particularly enjoyed was his knowledge of the architecture in the town of Florence and his knowledge of the paintings he showed us in Uffizi Gallery. Also, Marcelo is a native of Florence, so it made the tour feel that much more authentic. Plus, he can give great suggestions on where to eat and what other attractions in or near Florence there are to see. Amazing tour and Marcelo is the best! Great walking tour of Florence with our extremely informative and personal guide, Rose. Rose was a great guide. Rose was patient and always conscious of everyone's needs. Breaks, with coffee and snacks when we needed it. The Uffizi Gallery would not have been the same had not Rose pointed out the most extraordinary details of each painting and statue. A can't miss experience. The walking tour through Florence was educational and lovely! The Uffizi was awesome but there was a pretty significant delay in us getting in and our tour guide who was very nice and knowledgeable just went a little too deep for the 4 of us. We were spending 10-15 min on a few of the displays when we would have preferred to see more and get the Cliff Notes version of each. Incredible experience. Guide was great and very knowledgable. Skipping the line is well worth the extra expense. Emmanuella was a fantastic tour guide! She was extremely knowledgeable about Florence and everything in the uffitzi! I will definitely use this tour again! Nous avons beaucoup apprécié cette excursion. Notre guide connaissait vraiment bien sa matière. Il faisait très chaud et elle s'assurait que nous profitions le plus possible des recoins ombragés quand elle devait nous donner des explications.